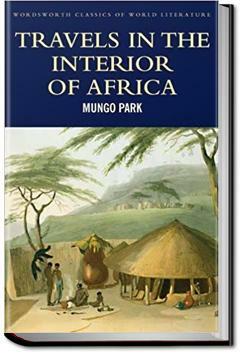 Mungo Park, a Scottish surgeon and explorer, was sent out by the 'Association for Promoting the Discovery of the Interior of Africa' after Major Houghton failed to return, to discover the if the River Niger was a tributary of either the river Senegal or Gambia in South Africa. This is the story of his first trip. The journey had many challenges, such as language, religions, imprisonment and robbery. Most of the trip he had nothing but his tattered clothes, a horse, a pocket compass and his hat where he kept his notes. After first following the Gambia River, he finally was the first European to reached the Niger River at Ségou. He continued along the Niger another 80 miles to Silla, where he had to turn around as he had no way of continuing without procuring more supplies. He then returned to England by boat, via America. An enlightening study of pre-colonial Western African culture, and an impressive adventure besides. Fires my wanderlust. As it can be read in a sitting or two, there's no reason to pass it up. Vol. 2 is coming up next. Fascinating account, but this volume covers only the outward part of Mungo Park's journey to the Niger. Fuller comments to follow once I have completed Volume 2.